In spite of the great amount of source music and guitar performances, David Newman's score to the 1989 film Bill & Ted's Excellent Adventure gets a considerable amount of screen time. In fact, it dominates much of the funny and fanciful history lesson with serious, orchestral writing that plays it straight. “It was pretty clear where music was going to go, and what it needed to do,” explained Newman. “It needed to let the jokes play, but it needed to play Bill and Ted’s relationship seriously and with some heart—without being sentimental. We didn’t want to comment on what goofy idiots they were, but we wanted the audience to be able to laugh at it and laugh with them." A soundtrack album released in 1989 was filled with rock and metal songs, but David Newman’s score was completely absent. 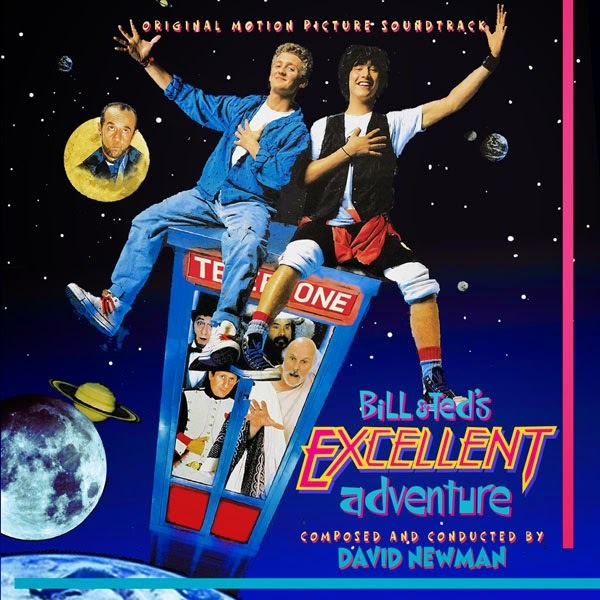 Now the composer’s witty, playful and heartfelt companion to the excellent adventures of Bill and Ted makes a triumphant appearance on compact disc, displaying his penchant for sweetness and melody in the comedy genre, along with the action and excitement of a full-blown sci-fi epic. All of the music Newman recorded at his sessions is featured in crisp stereo sound and presented from the original ½″ three-channel session masters and a two-track stereo session DAT that contained some of the electronic keyboard cues. In the film, Bill S. Preston, Esquire (Alex Winter) and Ted “Theodore” Logan (Keanu Reeves) are two best-friend dudes trying to make a most triumphant video for their band, Wyld Stallyns. Their career aspirations are jeopardized by the threat of flunking history most heinously, so Rufus (George Carlin) flies in from the future to help them and keep the excellent future they will spawn on course. Careening in a high-tech phone booth through time, the two distinguished colleagues bag several notable figures from their class assignment— Billy the Kid, Socrates, Joan of Arc, Abraham Lincoln—to arrive at the school auditorium just in time to make one bodaciously triumphant presentation (and pretty much save humanity). Just Announced and I have to say "Heck Yes"! I have the other soundtrack, but not this one.